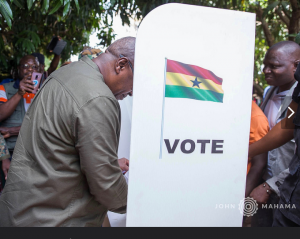 Former President John Dramani Mahama has received a massive endorsement at the National Democratic Congress headquarters in Accra where a special voting centre was created to enable national executives to vote. Out of the total 42 votes at the head office, Mr Mahama secured 33. About 67 were expected to vote but only 42 turned up. Former National Health Insurance Authority (NHIA) boos, Sylvester Mensah polled four (4) votes while Goosie Tanoh got two (2) votes. Alban Bagbin and Professor Joshua Alabi recorded one vote each. Alhaji Nurideen Mohammed and Ekwow Spio Garbrah got no votes at the NDC head office. There was one rejected vote.